Motherwell battled into the Scottish Cup semi final with a dramatic 2-1 win over hearts at Fir Park. Main scored the opener and Lafferty equalised from the spot but a marvellous volley from Carl McHugh sent us back to Hampden. It was a classic chest and volley from McHugh that was worthy of winning any game. The shame is that he had already received a yellow card, the second in the competition, and he will be suspended for the semi-final. Stephen Robinson stood by the eleven that had won in Dundee last weekend and they did not disappoint. We took the initiative right from the kick off and had the ball in the net before five minutes had elapsed. 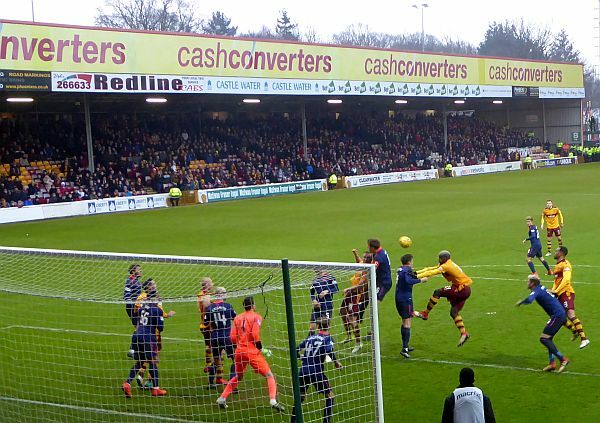 Referee Dallas took the view that McLaughlin had a hand on the ball as Cadden sent it over the line but the shaky vibes coming from the visitors’ defence gave cause for hope. Lafferty sent a tempting free kick into the side net but our opener was not long delayed. Tanner delivered a low driven corner that was allowed to squirm along the goal line and Main made certain. The striker delivered a first half of pain to his opponents as he acted as the focus of our attacks. Just after the half hour he took the ball inside the penalty box and set up Tanner but his effort was just high. We ruled the first period and probably should have had a bigger advantage by half-time. It was no surprise that Hearts changed shape and personnel at the break. Milinkovic replaced Callachan and the big visiting support were lifted at the improvement offered by their side (in a blue strip). Most of the play was in front of Carson’s goal and the equaliser arrived thanks to a penalty. Kipré was adjudged to have tripped Naismith and Lafferty converted. He was unlucky two minutes later to see his shot across goal rebound off the post. Bowman replaced the ineffective Ciftci. Carson produced a fine save at full stretch from Lafferty’s header as the game started to flow end to end. Frear replaced Tait as the last ten minutes arrived and he was to play a part in setting up the winner. McHugh blocked a defensive clearance full in the face and we gained possession. Bownam gave Frear a chance to cross and his ball was half cleared. McHugh collected on his chest and pinged a volley the ‘keeper’s top right corner. Fingers were not enough to keep the ball from the net and the ground exploded with a roar as ‘Well fans and players celebrated the strike that sent us to Hampden. The team took a well deserved bow after the final whistle as they lapped up the plaudits from the home stands.